So yes, the Steven Nuke is in full force... and I adored the episode 'Mr. Greg'. A musical episode with a classic broadway feel? Yes, please! So, obviously I had to sing along to it... which lead to my recording my own a capella version of "It's Over, Isn't It?" Obviously, this is a spoiler if you haven't watched the episode. And I won't fib, this song really strained my vocal range. You can hear me start in a really low key because of how high it finishes by the end of the song. Still, I think it's a fantastic song, and it really impresses me as to DeeDee Magno Hall's vocal talents. (That's Pearl's voice actress - she's done more than a little bit of musical stage work.) I hope you enjoy! To avoid a double post, I recently made a meme that's horrible and funny and... you've all heard the term "shitpost" by now, haven't you? 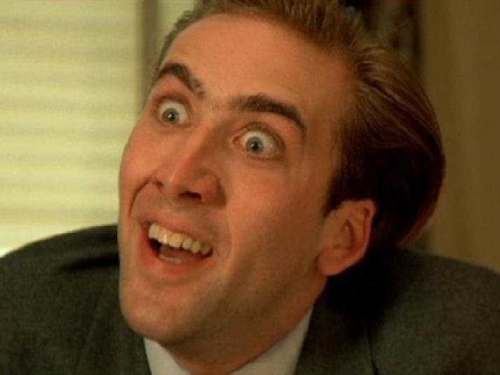 In a playful sense, it's to make something that makes you cringe and laugh at the same time. Well, I made this one in connection with events in "Too Short to Ride" - and since it's a visual gag, I'll put it behind a 'spoilers' tag. After which I have added "I’m sorry I’m a horrible person and I feel badly for everyone right now" - but I don't feel badly. I'm laughing my backside off at this. 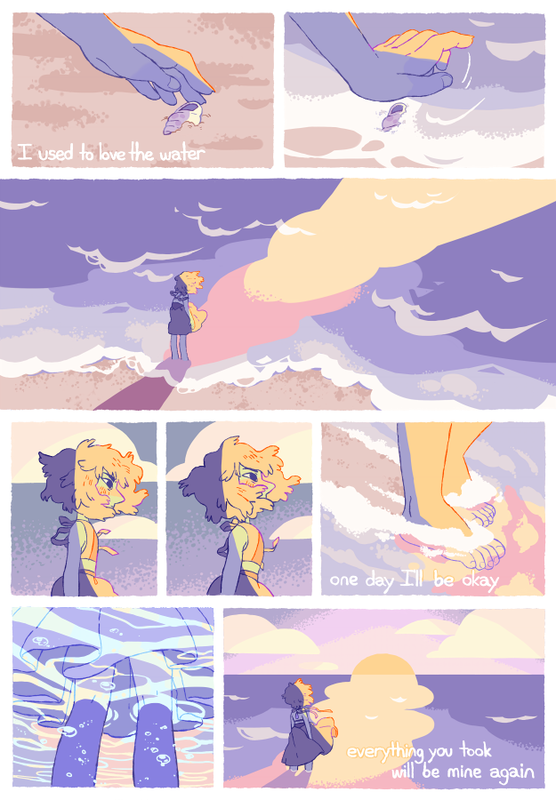 Steven Universe made me cry again... I love how the show talks about some pretty difficult things. I know, Artemisia! These last two episodes as well... I saw a cartoon once of Rebecca Sugar's face put on a doodle with a baseball bat, and on the bat was written "The Feels". Tonight's episode... wow. Obviously, 'Alone at Sea' addressed abusive relationships. Yet, it was done in such a way that it didn't feel preachy, like almost all of the moral lessons that they face in this show. They showed so much, like Lapis' troubles (her low self confidence, owning up to all of her past mistakes). Jasper's classic abuser's lines ("I’ve seen what you’re capable of. I thought I was a brute, but you… you’re a monster," to make Lapis feel badly) (trying to isolate the victim "This is between us!") (putting their past in a positive light "It’ll be better this time… I’ve changed! You’ve changed me! I’m the only one who can handle your kind of power"). And then there's Steven, trying to be a good friend and doing what a friend should who's going through all of this. He's trying to introduce her to new experiences, not putting pressure on her while being encouraging. When Jasper shows up, he does his best to intervene and keep Lapis from even having to deal with Jasper. SO much good and positive with this show, even as it wrenches out your heart. seeing centipeedle desperately try to return to her ship before she possibly lost what was left of her mind was heart rendering. Looks like shattering and blending is NOT the worst thing the diamonds can do. What the hell is this corruption thing? and man Abusive relationship vibes much? btw the official peridot twitter is hilarious. Apparently, the next upcoming 2 weeks of Steven Universe are going to be BIG. As in, everyone involved in the show has been posting on social media not to seek out leaks, because you'll spoil a lot for yourself if you do. I follow someone on Tumblr who admitted he looked for some leaks, and now he's disappointed he did. Meanwhile, the show is also going into overdrive as there will be a very short break between this massive Summer of Steven and the following season. The current season ends on Friday, August 12th and then a new season begins on Thursday, August 18th. Now, from what they're showing, it almost looks like they might be going to *gasp! * a semi-regular airing schedule, as the first three episodes of season 4 are all airing on Thursdays at 7 pm EST. This is just... wow. Feast or famine. 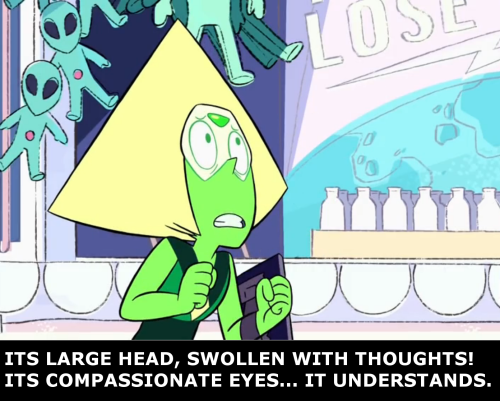 I'm having a difficult day today, but I thought I'd share a little Steven Universe meme that I created on Tumblr. It's a spoof of a classic Adventure Time sketch (I even cut 'n pasted the writing from the cards in the Adventure Time episode and changed the color of the background) where Jake and Finn decide to communicate only through cards for the day. I did it as something silly, but at this moment it has almost 6,000 notes! I've never made anything on Tumblr that spread this far. Finally watchingStevonnie engage in battle! So, last night there was the 2-part episode that marked the 99th & 100th episode of Steven Universe with 'Bismuth'. And I tell you, from paying attention to the online chatter, it's easily the most divisive episode for the fandom. What it's boiling down to is the decision of Rose Quartz to 'bubble' Bismuth without confiding in the other Crystal Gems as to what happened to her, as well as not to use Bismuth's weapon 'the breaking point'. A lot of the fans are going with the line, "It was a war... and if the Crystal Gems were captured, chances are that they would be shattered. why is it wrong for them to shatter other gems in their fight?" Which is a very classic way of seeing an intense conflict on this scale. People die in wars, it's what happens. I like this conversation between fans, because it's challenging many of the classic notions of how things were done. It's making people question and wonder why things have to be the way they've always been. Why do people have to be killed because we disagree? It may not be a stance that we can realistically reach in even our lifetime, but it's good thought to consider before we (as a species) are quick to pick up a gun and seek conflict. Steven isn't perfect, but he's shown to have this strong moral center that guides the Crystal Gems. He's ready for conflict if it happens, but that's not his first choice to resolve a problem. He protects, but he wants to resolve situations through understanding and communication. Yes, it's idealistic... but it's a cartoon about trying to always do the right thing. The other issue that came up was Rose Quartz lying about what happened to Bismuth. This was the more difficult choice, and one that by the end of the episode we see Steven go for the choice that was more honest. At the time the conflict between Bismuth and Rose Quartz happened, they were in the midst of frequent clashes with the Homeworld Gems. They were always outnumbered. Bismuth was clearly a popular gem among the Crystal Gems, energetic and charismatic. If Rose Quartz had a split with Bismuth, it could prove to split their group in half at a time when they were barely keeping the other forces at bay. It would have meant the end of the rebellion as the two smaller camps were individually overwhelmed. It was a morally gray problem, and there are plenty of people who can say "Rose did the best she could". However, Steven shows a maturity beyond his years by risking his connection with the other gems and telling them precisely what happened. And though the moment is glossed over, it's obvious that this choice hurts and is still accepted by the other Crystal Gems. That's the difference of Steven... he is willing to take a risk and communicate, where as Rose had her secrets. As an added little hint, there was a discussion between Bismuth and Pearl when they talked about how they were always outnumbered and Bismuth mentions to Pearl about the time Pearl took on the ship of Nephrites. One really sharp fan caught that, and brought up an image of nephrite as a stone... it's a sort of darker green, sometimes with darker speckles or bands. Which looks a lot like the colors of Centipeetle, who captained a ship. Bismuth also mentions other Crystal Gems such as 'Crazy Lace', 'Biggs', and 'Snowflake'. Which likely refers to crazy lace agate, biggs jasper, and snowflake obsidian. While I'm sure we haven't seen snowflake obsidian, biggs jasper definitely could be the tan corrupted gem that Jasper captured in Gem Hunt. And while there were some stylistic choices, crazy lace agate has so many different appearances it could be the green and red other corrupted gem that Jasper captured. All in all, there was a lot packed into those two episodes! I also felt like the choice of Biggs (Jasper) was a reference to Star Wars. Namely Biggs Darklighter, Luke Skywalker's best friend who dies in the assault on the Death Star. It was quite an episode. Location: In constant search of a witty thing to place in this box. Also, Wisconsin. I have some (very) scattered thoughts that have been on my mind regarding the episode "Crack the Whip." It's new enough that I'll spoiler it. Being at the mercy of iTunes, I'm usually a bit behind myself. At the moment when Amethyst was poofed and Jasper's hand reached out to grab her gem, was I the only one who was genuinely terrified that she would be shattered? I know kid shows don't normally do that sort of thing, but SU hasn't really shied away from addressing some heavier topics that even 'adult' shows rarely acknowledge, so I guess I find it plausible that they could tackle the very sudden loss of a loved one. Adventure Time came close to something that dramatic when Finn lost his arm, but backed off when it was magically undone after three episodes (that really cheesed me off, let me tell you). The direction they went instead was still good, going deeper into Amethyst's feelings about herself. That part of her I can understand, even though personality-wise I'm nothing like her. SU does a good job of making the characters feel real enough that I can fear for their safety from time to time, I guess is what I'm trying to say, if that makes any sense. The line "damage from the Diamonds" has me very worried about what the future may hold. also concerning Jasper we now know that when we first say her in the series and she said "rose quartz is a priority", it was much more personal than we thought.